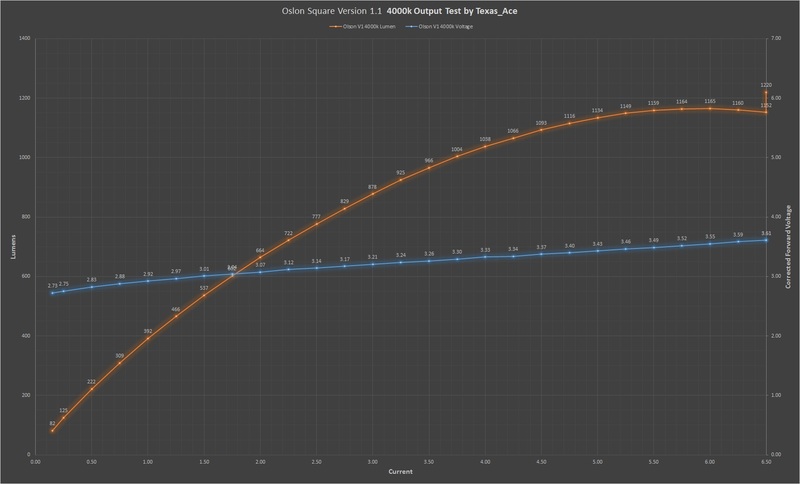 Oslon Square V1 and gen 3 output test by Texas_Ace. Exact comparison between my tests and Djozz! This is really interesting since Djozz has tested the same thing from I am guessing the same reel (djozz can you confirm?). Comparing the results they are quite close. It appears my numbers are a fairly consistent ~5% lower then his. Our numbers track pretty much spot on to each other. I am very happy with these results, the numbers are also close enough to be comparable for most things which is nice. If the flashlight that Djozz sent would show up that would be an even better comparison. I plan to toss these in some small zoomies to see how they compare for throw. I might try slicing the dome on one of them to see what happens. So now to the results. Nice work TA. Its good to see your results so close to Djozz’s. TA, I love seeing these charts, especially the comparison ones. 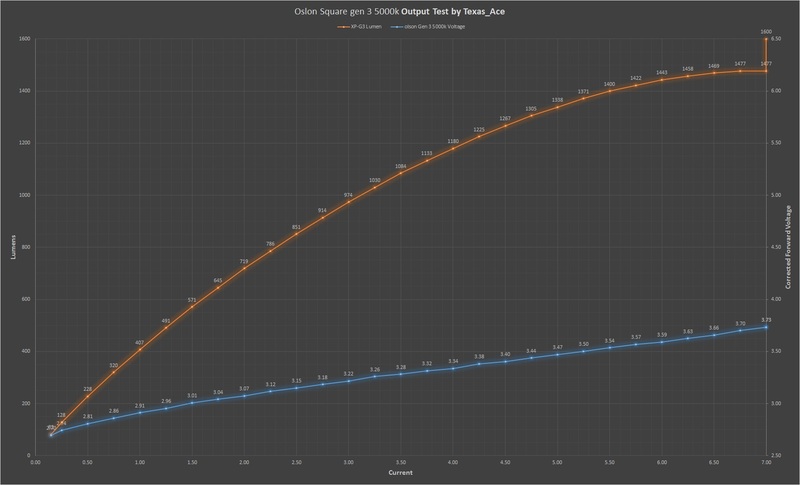 But one request… to aid us colorblind folks, would it be possible to use different markers for different LEDs, similar to how djozz does. One LED gets squares, one circles, diamonds, etc. Helps out a lot. For the life of me, I can’t tell what’s going on in that last chart. In the last one the highest is the 219C, middle is the 3rd gen and the lowest is the V1. I will see about changing the markers in the future, not sure if it allows it with this layout. I put the V1 square into a cheap zoomie to see what it would do. Not bad as is but obviously not all that bright. Interestingly with the dome on it has a circle hotspot with 2 holes out of the edge. I then sliced the dome to see the effect and the hotspot got a bit smaller and the tint got a bit warmer like expected but luckily no tint shift to the funky green/yellow. Overall though just not enough output to impress me and the die shape is kind of funny. I then put the 3rd gen in a cheap C8 sized light with a deep reflector (skywolfeyes tly-739). This light had a new gen XP-G2 in it before making around 400 lumens and reasonable throw. With the 3rd gen square it vastly improved the output and the throw, the hotspot was noticeably smaller even with the dome on and it makes around 650 lumens at similar drive currents. Throw like this was ~35k or 375m with a pretty nice beam pattern. I then sliced the dome on this one as well, a very noticeable improvement in hot spot and throw. 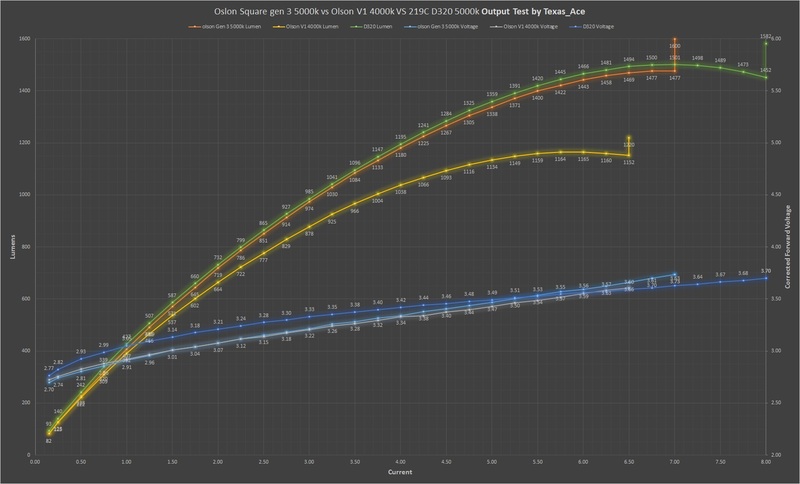 Hot spot shrunk by 50% or so and throw jumped to ~60kcd or 475m. Overall tint didn’t change much but it did add a slightly tint shift “ring” at the corona where it gets a bit warmer. It is a pencil thrower for sure, of which I am not a big fan of them generally, but for those that want good throw it is something to look into for those that do like them.